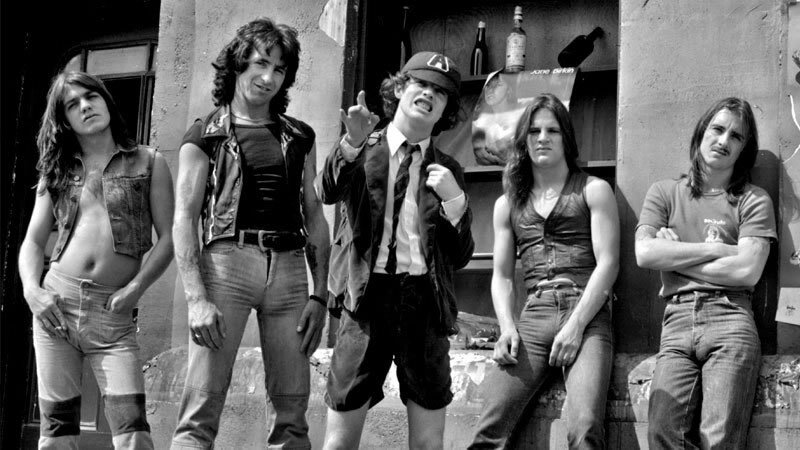 AC/DC who have sold more than 200 million records worldwide started their career living and working in Melbourne. In the book AC/DC Maximum Rock & Roll, manager Michael Browning says: "If it hadn't been for Melbourne, AC/DC wouldn't have existed. There wasn't enough of a support system anywhere else in the country [p93]. The brothers Malcolm and Angus might have been born in Scotland but make no mistake, without Melbourne there would be no AC/DC. Read more about AC/DC (acca dacca) below.. The first time I saw AC/DC was downstairs at Hard Rock in October 1974*. I was hooked, the boys presence on stage was simply electric. 40 years on I can still remember the heat, the beat and pure rock'n'roll. The drummer and bass guitarists changed a couple of times in the early gigs before Mark Evans & Phil Rudd joined to complete the lineup of Angus, Malcolm and Bon. We were what could be only described as AC/DC's first fan club, in Melbourne at least. We were a group of friends who went wherever the band was playing. Over a 2 year period we would have been to most AC/DC gigs all over Melbourne including Hard Rock, Town Halls, Pubs, Myer Music Bowl and Festival Hall. We would arrive early, help the 'real' roadies cart the gear into the venue and set-up. Often they would do two gigs in a night, a suburban pub first and then back into the city for a late session at Hard Rock. It really was a long to the top if you wanna Rock 'n' Roll, but we loved it. We were like a big family, the band, roadies and us tagging along, doing the gig and then back to the house (Lansdowne Road, East St Kilda) where the party continued. Years later, Malcolm would say that living together in that house in Melbourne was some of the happiest times of their lives.. also some of the craziest. Today, we go for dinner at the Croxton Hotel in Thornbury, and I smile when I think back to the heady days (May 20, 1975) when it was one of the roughest pubs in Melbourne. I remember an all-in brawl, Bon wasn't backward when it came to looking after his mates, and I remember Phil of all people (we didnt get along at first) punching some guys lights out, just as the guy was about to dim mine. I remember Festival Hall* and the Myer Music Bowl** and then onto ABC in Ripponleigh for Countdown. Bon was at his brilliant best swinging out on a rope into the audience until the crowd grabbed the rope and Bon was stuck. Who can forget Swanston Street (City Square and the truck) for It's a Long Way to the Top (If You Wanna Rock 'n' Roll)? Interestingly, the official music video clip above uploaded on 12 Dec 2009 does not feature the truck as shown in the clip that was played on TV at the time. There are glimpses of the truck in this unofficial clip or the complete video (remastered here). I became the 'retriever' at one point, chasing around beer soaked floors of Melbourne's pubs for Angus' school cap, you see, we had became roadies without pay. As a group of friends we did so many gigs that they all meld into one but Doris (GOD bless her) loved every minute of it, as did we! It's now rock'n'roll history after Melbourne discovered Acca-Dacca, so did the rest of the world, going on to become one of the biggest bands in the world. The original Hard Rock Cafe owned by their manager at the time (Michael Browning) was on the corner of Flinders and Spring Street, Melbourne. Doris was a beautiful women struck down in her prime on a cold Brunswick Street, Fitzroy night in 1978. 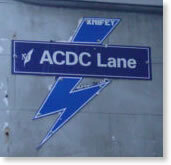 October 1, 2004 | Corporation Lane was renamed ACDC Lane described as a victory for rock 'n' roll. Melbourne City Council unanimously voted to honour the Australian rockers, who in 1975 filmed their classic rock anthem It's a Long Way to the Top on the back of a flatbed truck travelling down Swanston Street. Reason: Many including: music video for "It's a Long Way to the Top (If You Wanna Rock 'n' Roll)" filmed on Melbourne's Swanston Street, AC/DC's status as cultural ambassadors for Australia, the band's ties to Melbourne, and the lane's position in the city's bar district. When the band was based in Melbourne (70's), AC/DC shared a house at 6 Landsowne Road, St Kilda East. 'Whole Lotta Rosie' was named after their next-door neighbour Rosie. * Header image: alternates between the band as we knew it in 1974 and the band the world came to know, logo, Bon and Angus. Dirty Deeds: My Life Inside/Outside Of AC/DC by Mark Evans (former bass player).